The after-market auto parts retailer is the leading stock in an industry primed for further growth. There's still plenty of time to get in the zone with AutoZone's stock. Image source: time anchor. The after-market auto parts industry is ripe for consolidation. While Japanese tire maker Bridgestone lost the chance to buy Pep Boys after billionaire activist investor Carl Icahn out bid it with a winning $1 billion offer, hedge fund Starboard Value had considered Advance Auto Parts (NYSE:AAP) a possible candidate for sale with rival O'Reilly Automotive (NASDAQ:ORLY) seen as a potential suitor. It owns the largest share of the market. It's the most profitable of the major players. It operates in the segment that's most likely to benefit from current economic conditions. 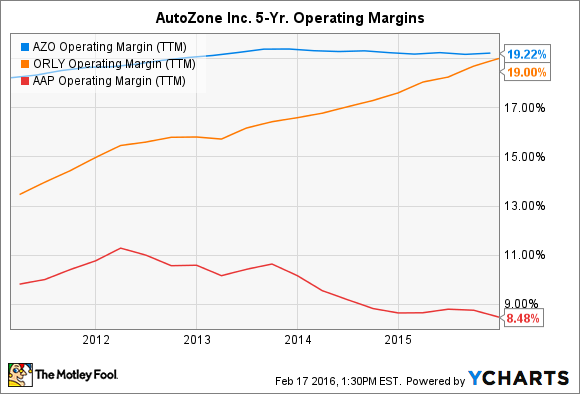 Even though AutoZone's stock is priced at over $750 a share, and has risen 22% over the past year, there's good reason to believe it can still rise in the future. 1. The market is in its favor. The latest data from U.S. Department of Transportation shows seasonally adjusted vehicle miles traveled has never been greater, hitting over 264 billion seasonally adjusted miles last November, while oil costs around $30 a barrel, among its lowest price in more than a decade. That's a potent combination for expecting people continuing to drive ever-greater numbers of miles. At the same time, cars keep getting older, with the transportation agency saying as of 2014, the average age of vehicles on the road was 11.4 years the oldest they've ever been. Although Ford and GM might look at those same figures and see it as an argument in favor of selling more cars -- 2015 was a record year for sales for the auto industry -- a deteriorating economy suggests owners are going to want to hold onto their cars longer and somehow keep them running (short of duct tape and baling wire). 2. AutoZone is the after-market auto parts leader for DIYers. When Starboard Value was agitating for change at Advance Auto Parts, it pointed out both the auto parts retailer and AutoZone were the biggest players in the marketplace with a 9% share, ahead of O'Reilly and Genuine Parts (NYSE:GPC) at 6% each. Yet the two leaders targeted different markets: Advance was skewed toward the do-it-for-me segment, with 57% of its business coming from there, while 82% of AutoZone's revenues were derived from the do-it-yourself segment. AZO Operating Margin (TTM) data by YCharts. The hedge fund argued the growing complexity of cars bode well for retailers catering to DIFMs, but an equally strong argument can be made that a sour economy will have people opting to fix their cars themselves anyway, giving preference to AutoZone and Genuine Parts, which oversees some 4,900 independently owned NAPA Auto Parts stores. 3. The industry does well in good times or bad. While an ailing economy can provide a motivator to car owners to maintain their vehicles themselves, the after-market auto parts industry is largely protected from cyclical downturns, and even countercyclical moves. It's basically an all-weather performer. According to Starboard Value, between the late 1990s and 2014, there were just three years total where any of the industry players suffered from falling comparable-store sales, with the worst being AutoZone's 2.1% drop in 2005. In short, sales are virtually always going up. Because AutoZone is the industry leader and the most profitable company in the segment of the market that should perform best as it benefits from industry trends breaking in its favor, look for AutoZone to rev its engine a little more yet and watch its stock jump off the line higher.